In the mood for some Kills of the Week? Like it or not, that's what you're going to get. The following were some noteworthy suicide ganks performed by the New Order during the week of May 12 @ 00:00 EVEtime through May 18 @ 23:59 EVEtime. 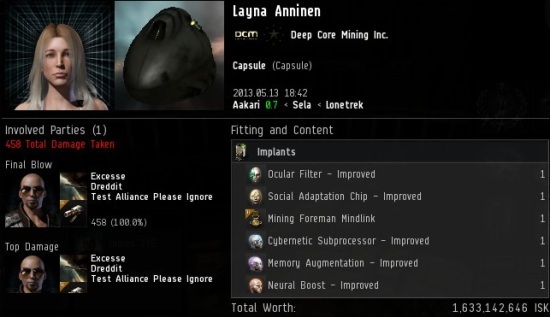 Let's get the week's podmail out of the way: Layna Anninen lost 1.6 billion isk worth of implants thanks to Agent Excesse's quick thinking and steadfast resolve. Layna's implants were protected by her Mackinaw, but Agents Lord MuffloN and Excesse thoughtfully removed it first. Capsules may be my favorite vessels to destroy in this game, because you just never know what you'll find inside. They're like Easter egg-shaped Easter eggs. 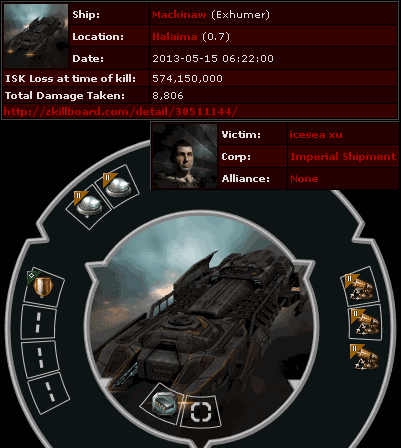 This week's theme for dead mining ships is big, bigger, biggest. We begin with icesea xu's 574 million isk Mackinaw, popped by Agents Capt Starfox, Agrona Martin, Gavin9012, Gavril Ilizarov, Dante Lobos, and Ledrian Saisima (who was in a Merlin for some reason). icesea xu's Mackinaw fitting fascinates me. He spent all that money on exactly one tank mod, but left the rest of his midslots empty. This brings to mind the question posed by a famous philosopher: "What in the HELL are you doing?" 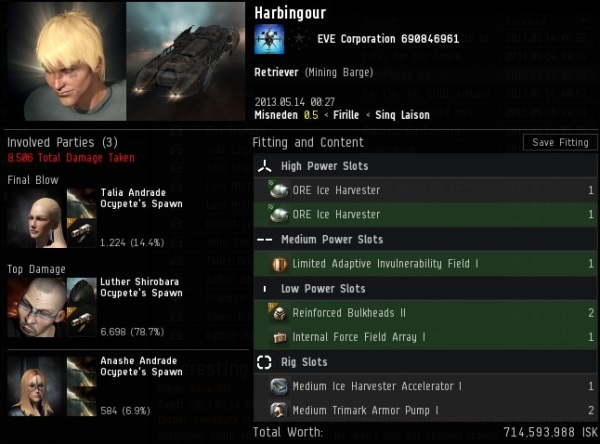 The numbers don't lie: Harbingour went boom while flying a record-shattering 714 million isk Retriever. Agents Talia Andrade, Luther Shirobara, and Anashe Andrade surely earned their stripes with this kill--and the gratitude of the highsec community. Harbingour apparently stuffed whatever tank mods he had on hand into the limited slots available to his ship. 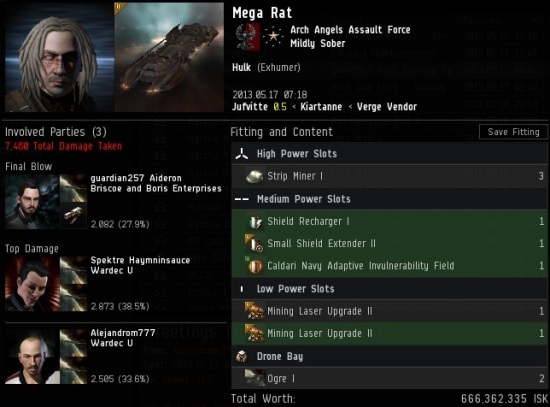 Because going around in a totally untanked 714 million isk Retriever would have been really stupid. An omnitanked retriever. How quaint. He spent hundreds of millions of ISK on storyline ice harvesters that function exactly the same as ordinary T2 ice harvesters (even the same CPU usage), then instead of protecting his investment with a mining permit, he chose to impair his retriever's ice intake by omnitanking it. How are carebears so bad at mining? We need to be selling more t2 Mining Foreman Mindlinks. Say it with me: Invulnerability fields do not make you invulnerable. 112k EHP vs Antimatter, good yields and happy mining faces that STAY ATK and enjoy this game as a multiplayer sandbox. Pods are like Kinder Eggs, while not available in every country, they do contain a surprise toy. Pods can contain a surprise too. Why are pod pilots surprised when they are ganked and pod killed while mining without a permit any more? And he was cocky as heck in local too. Luther Shirobara is *not* an agent of the New Order, and Ocypete's Spawn are *not* part of the New Order; however, Ocypete's Spawn allows its members to engage in whatever activities they wish, and so some of its pilots might be affiliated with the New Order from time to time. OCYPE offers ganks-for-hire and does *not* collect money in exchange for mining pemits. Please amend this inaccuracy in your reporting. Thank you--and happy ganking. Luther Shirobara, welcome to the New Order! Happy to have you aboard! Where are the orca kills :colbert:?